Muidinga, a young boy, calls the elderly Tuahir “uncle,” but they aren’t related. Tuahir quasi-adopted him after seeing him in a refugee camp, sick and reduced to an animal-like state. Finding little safety or support even there, they’ve long since taken to wandering the inland dirt roads taking food and shelter where they can and avoiding the roving bands of loosely-affiliated soldiers. 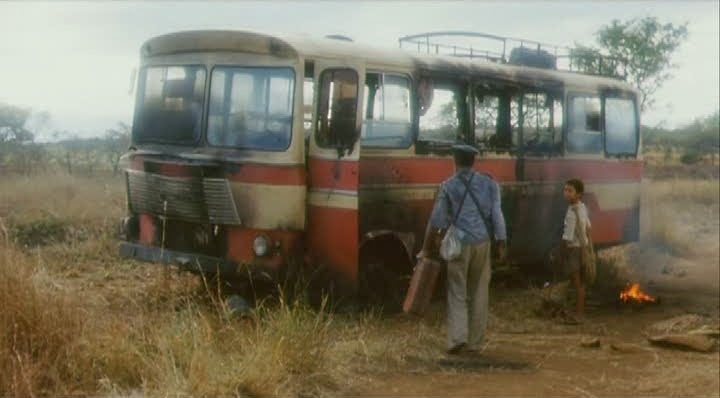 The film begins with the two finding a burnt-out bus, which, after they bury the corpses inside, becomes their primary shelter and anchor point. 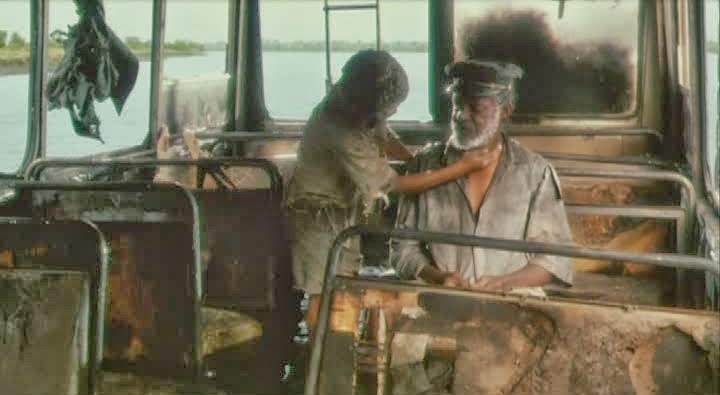 Searching the possessions of the former passengers, Muidinga finds the diary of Kindzu. Tuahir, who is illiterate (not to mention practical and without illusions), would rather use it for tinder, but Muidinga takes to reading it at night, introducing us to a second narrative in which Kindzu witnesses the onset of the civil war and the destruction of his family and friends, but is given new purpose when he meets Farida, a beautiful abandoned woman living alone on a drifting yacht. She vows to sail away with him if he first returns to land and finds her son. Muidinga grows increasingly convinced that he is the lost child, but must deal with the immediate realities of his day-to-day survival. He and Tuahir adopt a goat only to lose it in a field of landmines, are captured by a crazy man with cannibalistic intentions, and find themselves eerily stumbling back to the same bus again and again as though they are sleepwalking in circles, trapped in a reoccurring dream. 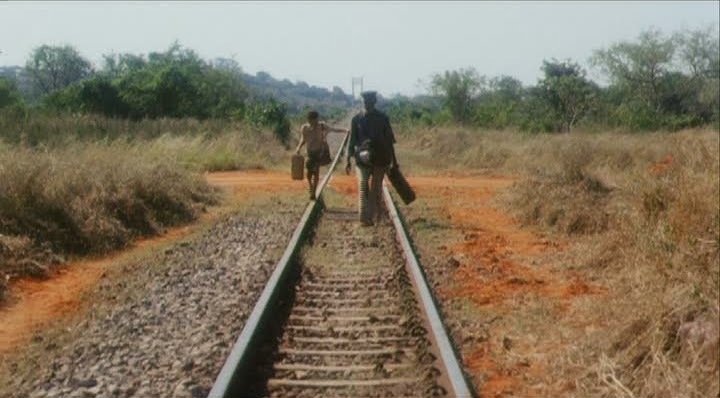 It purportedly took director Teresa Prata seven years to adapt Mozambican author Mia Couto’s landmark 1992 book to the screen, but the result is one of African cinema’s most distinctive visions. She preserves, while bringing in her own interpretation, the novel’s magical realism, ghostly ambiance and layered allegory, without losing the emotional heart of Muidinga and Tuahir’s lived-in tough-love chemistry or the hellish realities of Mozambique’s blood-soaked multi-decade struggle for stability. Though it has a lot to say about the tragic chaos of civil war, Sleepwalking Land shares a lot with post-apocalyptic sci-fi, complete with bombed-out uninhabited landscapes, murderous bands of marauders and lone survivors picking through the ruins. 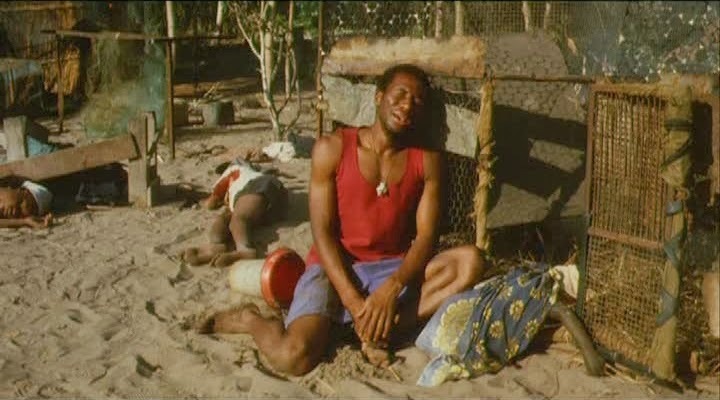 The sophisticated structure, switching between Muidinga/Tuahir and Kindzu/Farida, allows Couto and Prata to examine the fallout of the bloodshed and hardship on three generations while also establishing a strange continuity that evolves from thematic (loss, survival and finally hope) to parental (as Muidinga tries to build a family from the few materials available) to literal, as the stories finally and impossibly converge. Though the film slips into outright fantasy to accommodate its characters’ desperate desire for a happier future, it's clear that the film isn’t suggesting that we lie to ourselves, but that we look beyond surface realities for our answers. This is a film more about murky existential regions rather than clear-cut political and economic arenas and it urges us to figure out questions like who and what we are, both as a people and as a country, as a prerequisite for understanding how everything fell to pieces and how to put it back together again.